Ever had one of those days? Yeah, me too. Culture Shock ends today – don’t forget to stop by before it closes and shop! Donation items support Doctors Without Borders (in case you haven’t heard). Okay, I can’t keep that up, but sometimes it fun to pretend. *Doing this quickly, so… for SLurl links to Culture Shock, you can find them on the event blog. For other SLurls, you can find them on the SL Locations page on my blog. …but I think you already knew that. 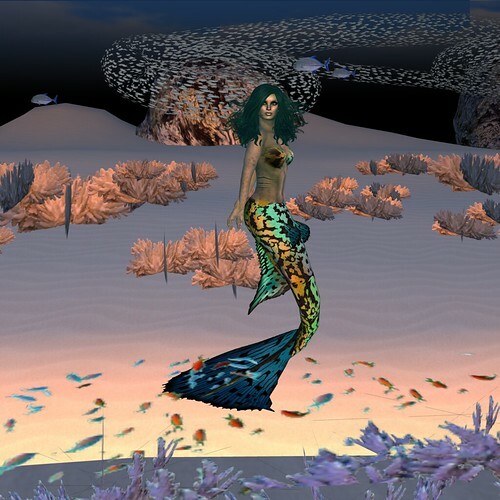 …not quite a human, but that’s what makes mermaids so special – so magical. Who doesn’t want to play under the water? Enjoying the sunshine and being able to swim without having to come up for air. Perfection. The important stuff… Mer-chandise Cove provided the beautiful mermaid outfit in picture 1 for one of their RFL donation items at the Fantasy Faire. They can be found on Siren’s Secret. The top and belt is the Tidal Treasure item from their regular catalog. So glad I got to try out this new-to-me store! Where are Jack and Janet? I forgot my key again! Waning Summer….sounds so melodramatic doesn’t it? Sweetest Goodbye is going away at the end of the month, which is too bad because Morphine Janick is a fantastically talented designer. So, grab what you can – really cute stuff at 50% off. Anyway, rocking out is almost as important as standing around trying to look like you’re doing something so that the crazed instructor at the front of the room won’t scream at you. What? You didn’t have those kind of aerobics instructors? Clearly your workout was not going to be effective. NB: I am a HUGE dork. I dork out over the oddest things. I know that, I’ve accepted that, and I’ve moved on. If you don’t want to read about my dorkiness over color names, the styling credits are at the bottom of the page, and more pics can be found on Flickr. You’re alone now, after getting back from a long night/day of dancing (or some other social activity) with your prince (or princess, or friends, or goldfish) and you feel hopeful, excited, like something great adventure just started. If the story had an author, this is the part after they’ve come back for you, and said goodbye one more time. Otherwise, you’ve just come home (generally speaking, the whole coming-back-to-see-you-one-last-time doesn’t really happen too often) and you’re alone. You’re nervous and giddy and your new adventure all you want to talk or think about, but you also don’t want to talk about it to anyone because if you speak of it, or even think on it too much… it might disappear. You feel alive. I’d rather be at the beach. There is a reason that “work” is a four-letter word, and that’s all I’m going to say about it. Another picture of this outfit on my Flickr. It’s hot outside, and not in a good way. Don’t get me wrong, I like Summer, or I liked Summer back in the day. I think it was a Wednesday. Anyway, it’s hot and humid, and when things get hot and humid, the only thing you can do is wear as little as possible. Luckily, BOOM has that covered.